I started writing what became this post as a quick tumblr hit on a single graph - as I started writing I brought in comments on the OCC piece more suited to my coldaircurrents site, and as I felt it necessary to point out the data problems are actually people/organization problems, the work ended up on my more flippant Wordpress site. “ Empowering Ontario: Constraining Costs and Staying Competitive in the Electricity Market, takes a look at the driving factors behind rising electricity costs in Ontario. I’m sure that’s confusing to many, but that "Businesses below 3 MW average monthly peak" class of customer did see the commodity rate it pays for electricity rise 25% from 2014′s second quarter to 2015′s, so I’m not surprised there’s some motivation to address the issues. However, the Chamber has more work to do in getting through the confusion. The Chamber’s recommendation that hardworking families and seniors pay higher electricity bills is not something our government will accept. We are proud of our commitment to remove the Debt Retirement Charge from residential bills beginning January 1, 2016 –two years earlier than planned. This is an important step in helping Ontario families reduce the cost of electricity by an average of $70 a year. As a former actual smaller business guy (with a small ongoing stake in one), I don't much like the people who vote frivolously and expect somebody else to work harder to compensate. Ending the payment for the voter and choosing to have businesses bear a greater burden is doubly reprehensible - it's just wrong to decide non-voting entities should pay for the mistakes made by governments and it's just stupid to think that won't have a negative impact on the economy. Ratepayers have been given, in the past 5 years with just the OCEB, twice what's left of the alleged Residual Stranded Debt, yet the government wishes to claim the debt continues in order to wring more money out of businesses. The global adjustment is getting described a lot lately. It is the difference between the costs of procured supply and the money recovered through the sale of that production; it indicates how poorly the market functions and demonstrates the quality of supply and pricing decisions. 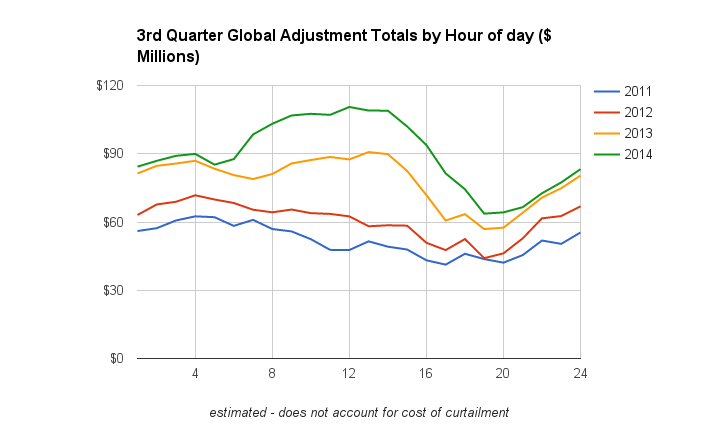 My estimates of hourly global adjustment totals demonstrates the cost spiral of the second quarter is disproportionately due to growth in the middle of the day - the hours of peak solar energy. Two things can move the global adjustment - recovery of costs on the market dropping (with price) and the cost of supply rising. With solar feed-in tariffs, both occur: expensive unnecessary supply drives down market price. The graph demonstrates the cost impact exquisitely. The market is increasingly oversupplied with increasingly expensive, increasingly unnecessary generation. 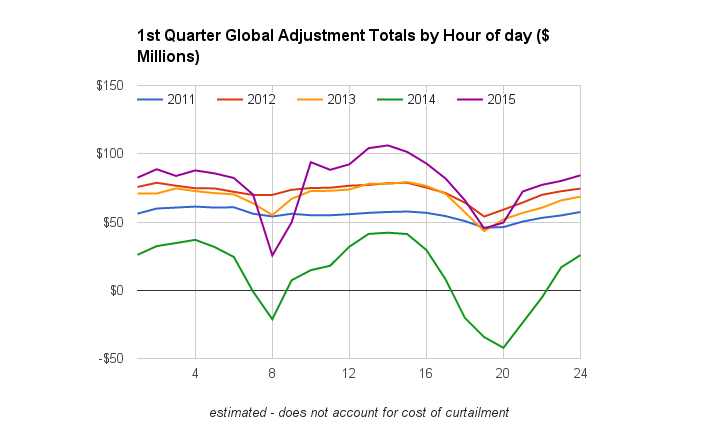 The growth in the global adjustment during solar's peak hours is exceptional in 2015's second quarter, but it's also a constant trend looking at past third quarters. 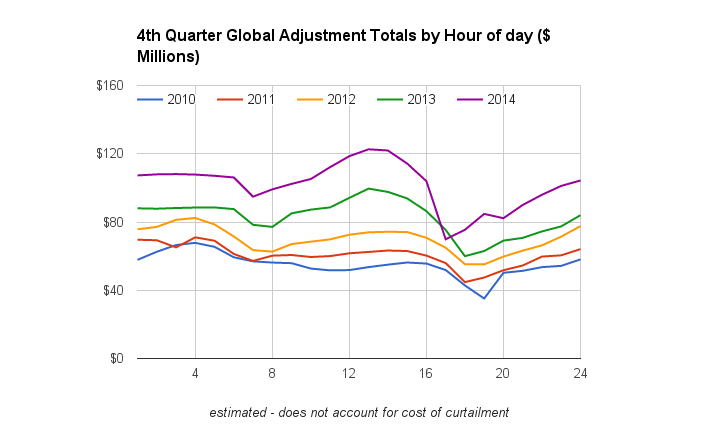 Each year the global adjustment moves disproportionately higher in the middle of the day. And in the fourth quarter... the same; the global adjustment has pushed higher every year and disproportionately the growth is in the middle of the day. 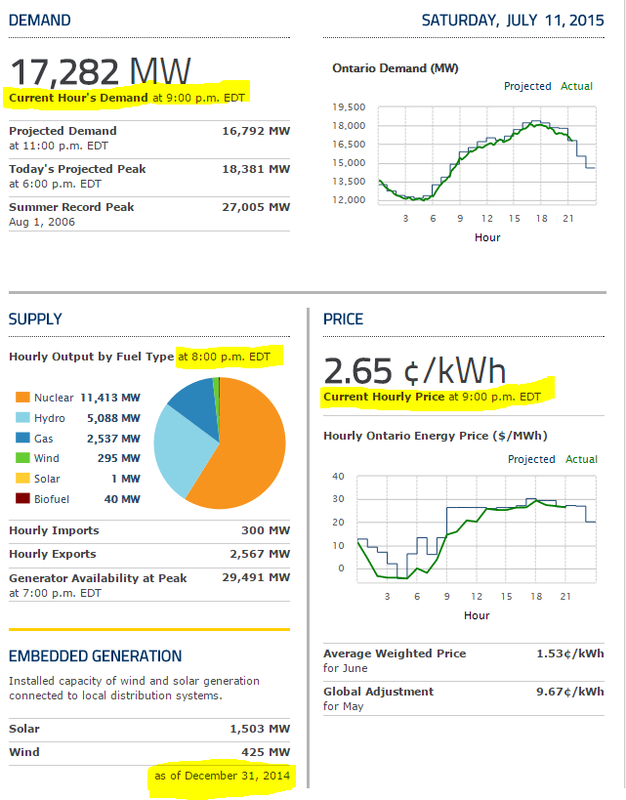 That big drop at hour 17 (the market always operates in Eastern Standard time) is a warning to watch for price spikes as wind and solar grow. If there's a major blackout this year, I'd bet it occurs at dusk on a cold day later in the year. 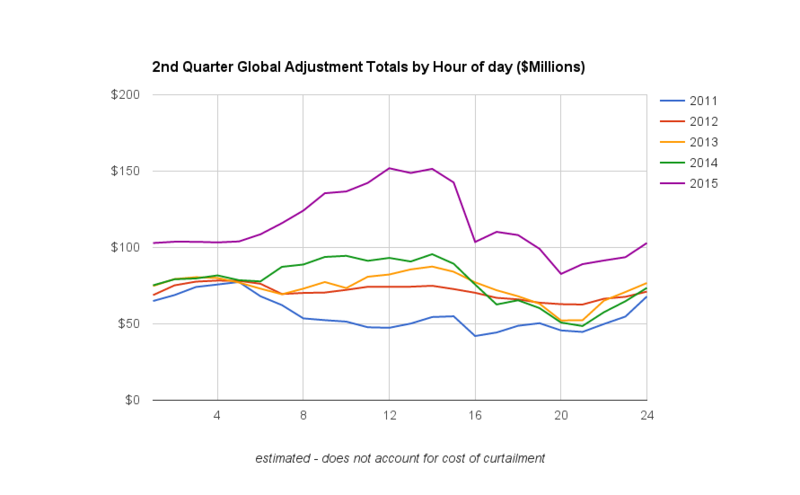 The first quarter is slightly different due to very cold winters in 2014 and 2015, but the trend to the greatest global adjustment costs moving to sunny hours is the same. Note our supply has been better suited to higher demand colder winters, which is indicated by the global adjustment being lowest during the actual peak demand periods. noting the huge cost impact of solar, as I have, I note they have a number for embedded generation that is over 6 months old. Not much discipline there, and reality is the IESO reports neither what people outside of their small circle would recognize as demand, nor what casual observers should think of as supply. What is a smart meter to do when only curious (and talented) outsiders can note the enormous increases in "On-Peak" global adjustment dollars? I can't imagine a smart meter system could be programmed to advise severely increasing the on-peak time-of-use rate during the second quarter of 2015 - as the Ontario Energy Board did for Summer 2015. The OCC report errs in calling for both "unlocking the power of smart meter data" and "[increasing] the peak-to-off-peak ratio under time-of-use pricing." That error is indicative of the deeply confused culture the pop sensation policies of the past 7 years developed. My data analysis indicates the highest potential action for mitigating electricity price increases is now sourcing technically qualified new people, from different cultures, to lead in policy and execution.